How about a little giveaway for a Friday? The winner will receive a few items from my Sew South Swag bag last month. Just leave a comment to be entered! Please leave your email if it's not connected to your profile. Giveaway is closed. Thanks for giveaway such beautiful things!!! yay! Thanks for hosting this giveaway! Wow! You are sweet! Thanks for hosting the giveaway! Thanks for your generosity! All the products would be so helpful! Thanks for so generously sharing your awesome swag! Hope you have a wonderful weekend! Those magazines especially look super, thank you for sharing. Hope an international entry is OK! Kati what a fabulous giveaway. Thank you so much! Yay...I will take these leftovers any day! Thanks for the chance. What a super bunch of fun things! Wow! Can I join in from England please??? Such a generous giveaway! I was just reading your post on Franken-batting. I found it so useful. I have been joining smaller pieces together for cushion covers and smaller quilts, but with some overlap where the pieces join. I had not heard of an edge joining foot until now! I'm looking forward to trying out your method. Thanks for sharing! Nice! So difficult to get quilting magazines here in the Middle East, I would love to win! Thanks for the opportunity. That's a lot of quilt swag for one bag! How generous of you to share! That's such a lovely gestures, to share some of your swag. Thanks for the chance to win! Thanks for the chance to win! I really want to go to a retreat soon. Thanks for such a generous Friday giveaway! Thanks for sharing, it's always fun to win! Quite a bount! I wonder what was in the rest of the swag bag. Thanks for the chance to win something. I love getting packages in the mail. Thanks for the chance and greetings from Germany! Thanks for the chance--I am SO in need of a rotary cutter! Mine just broke :( Wish I could have gone, as I am sure they are a blast!!! Wow. That looks like a fun giveaway! THANKS for the giveaway. Looks like good stuff. Yes that would be LOVELY! How nice of you to give away some of your swag! You are so sweet to share! I just stumbled upon your blog while looking for hex templates. Found them! Thanks! So many wonderful tutorials. Thank you for hosting such an awesome giveaway! Keeping my fingers crossed! Thank you! Sew South sounds amazing! I would have loved to go to Sew South - maybe next year! Thanks for the giveaway! Awesome giveaway! I love me some magazines!!! What a great giveaway! I love all of those magazines, have been wanting to try and Olfa, and just saw that fabric line yesterday! Sew South looks like it is a lot of fun.....I would love to go someday!! Thank you for sharing! What a sweet giveaway, thanks!! Nice swag. thanks for the offer! Lovely giveaway, thanks for the chance! HI, thanks for sharing on your Blog+in this neat giveaway! Great swag!! Thanks for the giveaway and chance to win! What fun swag - count me in! Thanks so much for the chance to win! Thanks for the great giveaway! Happy Friday! Fun! I love your work! I appreciate the chance to win! Great giveaway! Thank you!! And Happy Friday! Fun giveaway, thank you! I love those magazines! Thank you for the chance to win great stuff!! Love it!! How fun! Thank you for sharing! :) It sounds like it was an amazing retreat. Yay, love Fridays! Thanks for the giveaway. Have a great weekend. Lovely swag, so generous. Thanks for this chance! Wow! Thanks for the chance!! Oh there are great things! Nice ......not as good as actually being there.......but very nice all the same. oh what a happy bundle!! thanks for the giveaway. Happy Friday! The giveaway win would be Happy Everyday! Thanks for the chance to win these great items! Always nice to check out new magazines. Fabric and a rotary cutter, too. Thank you. Thanks for the giveaway. I really like Stitch magazine and those charm squares look lovely. Lots of great stuff in this giveaway -- very generous of you to share! Lovely Swag, Thanks for sharing! TGIF with gifts! Love it. I'm putting the finishing touches on my first quilt so I'm in the mood to see these items and dream about how I'd use them for my next project. Thanks for hosting! Oh wow, I'd love to read the magazines and make something with the beautiful fabric. Thanks so much for the giveaway. Thanks for sharing your "fun stuff"! So many nice things. Thanks for the chance. What lovely quilting items! Thanks for the chance to win! Thanks for the chance, love those charm packs, and of course it all, but love them! Thanks for the chance to win some lovely crafty items. Sew South sounds like lots of fun! thanks for sharing! Jealous you got to go. I'm hoping to go in the future. Thanks for sharing hour swag! Great giveaway thanks for the chance to enter! Sweet swag! Thanks for sharing. Wow, how beautiful. Very kind of you to give them away. Thanks for the chance to win! That's some cool loot! I would love to read those magazines! But what caught my eye was your "About Me" profile. I too am lucky enough to have a husband and children who are supportive and interested in my fabric, applique, quilting, and blogging interests! We really need that, don't we?! What a lovely collection of goodies - those magazines look interesting! Thanks for the opportunity. fun bundle, I'm too cheap to buy magazines but I always want them so bad, so I'd love to win! Plus the darling charm packs, thanks so much for sharing. What fun! Thanks for the nice chance to win this Friday night! Sew South sounded like a lot of fun. Maybe next year. I like your Crooked Cabins. Thanks for this nice giveaway! Thank you for offering this! I am really missing US publications. Awesome swag!!! Thanks for the chance!!!! Thanks for the chance to win! Have a great weekend. Nice mix of products :) Fabric is always nice but I like these items. Those charms so so cute - what a great mix of items. Thank you! Cool giveaway. This event sounded like fun. Yummy goodies! Thanks for a generous giveaway. Yahoo, more quilty things to add to my well-loved collection. Love. Thank you for sharing your swag! I haven't seen any of these magazines before so would be very intrigued by them. Wow! what a great treat. Thanks for the chance to win!! I'm glad that you got to go to Sew South! I hope to do that some year. Thanks for the generous giveaway! 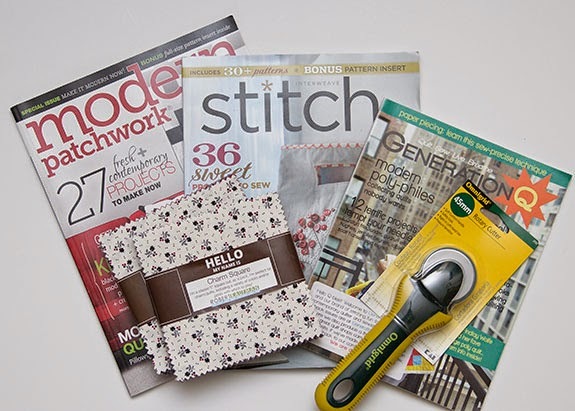 I love to read and sew with this swag! Nice giveaway, thanks for doing that! Awesome giveaway! Thanks for sharing with us. Beautiful giveaway. Thanks for doing that. Thanks for hosting this wonderful giveaway!! Thanks for sharing. Sew South looked like great fun. Loving your App quilt too. It looked like lots of fun. Thanks for sharing your swag! How nice of you to share the goodies! Would love to win those magazines. The rest looks pretty neat too. Thanks for the chance to win. I don't even think I can buy those magazines in my neck of the woods. Thanks for the opportunity! Nice giveaway, thanks for the chance. Thanks so much for the giveaway! I love Modern Patchwork especially, so I will keep my fingers crossed! Would LOVE some of that swag! Thanks for the give away! thanks for the giveaway! Would love to look through these! Lovely, especially those charm squares! Looks like a cool giveaway! Thanks for the chance. Love all the tutorials. Looks like great swag! Thanks for the giveaway. Sew South Swag Giveaway Winner!